Nathan is to the point where he enjoys testing boundaries. Sometimes I have to tell him “no no,” like when he yanks on the blinds the second I turn my head, threatening to bring the whole thing down on top of him. His changing table is in front of a window, but this morning I had a momentary lapse in sanity and forgot to raise the blinds. I was changing him on the changing table and I ducked down for a millisecond (literally!) 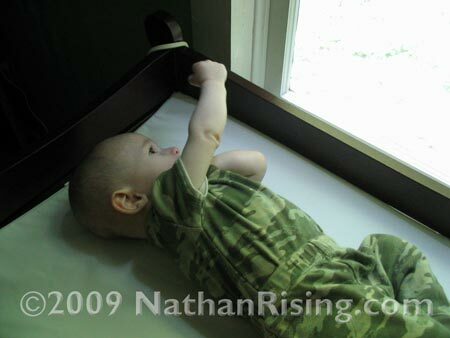 to retrieve a clean diaper… when I popped back up, he had the blinds wrapped around his pudgy little fist, pulling them towards him. “Nathan! No no!” I said as I tried to pry his fingers free. He refused to let go. “Nathan! Buddy, Mommy said no no!” I continued to wrestle with his fingers while he looked up at me, smiling mischievously. “Let go,” I said. “This is dangerous!” He still wouldn’t let go. I would pry one finger off and start working on another one when the first freed finger would snap shut again, gripping the blinds with an almost inhuman strength. Do all babies have such strong grasps? I tried dangling a toy in front of his face to distract him, but he wouldn’t take the bait. He merely laughed, swatting at the toy with his free right hand. With his left hand, he continued straining to pull the blinds towards his open and drooling mouth in an effort to completely and totally consume them. I finally pried his slobbery fingers free and what did Nathan do? He reached out and grabbed the blinds again. Again! Fortunately, I was able to grab his hand before he managed to get good grip. I immediately raised the blinds in an attempt to thwart any future grabbings. He rolled over on his side and raised his fist triumphantly into the air, as if to warn the world that his willpower is a force to be reckoned with. So, is it just me, or are Paul and I going to have our hands full as Nathan gets older? Because I have a feeling there are going to be quite a few Wars of the Wills. This kid has perseverance.